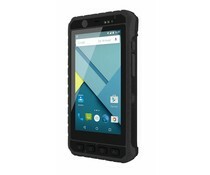 4.3 " rugged handheld Android PDA met 800 x 480 display. ARM® Cortex™-A7 Quad Core 1.5Ghz processor, P-CAP touchscreen, 1 GB SDRAM, 4 GB eMMC, Wi-Fi/ Bluetooth 3.0/ GPS / 3G, 2 x rear & front camera. 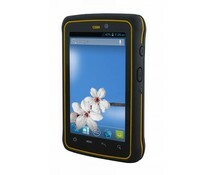 4.3 " rugged handheld Android PDA met 800 x 480 display. ARM® Cortex™-A7 Quad Core 1.5Ghz processor, P-CAP touchscreen, 1 GB SDRAM, 4 GB eMMC, Wi-Fi/ Bluetooth 3.0/ GPS / 3G, 2 x rear & front camera. 1D/2D barcodescanner. Robuuste 5 ” handheld Android PDA voor veeleisende toepassingen. ARM® Cortex™-A53 Octa-core 1.3GHz. Standaard 2 GB SDRAM, 16 GB eMMC, GPS, WLAN, Bluetooth en WWAN. Inclusief 1D/2D Barcode scanner.